Switching on the CCS. 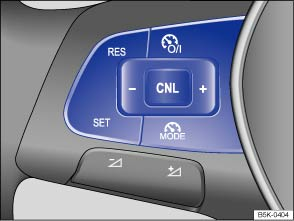 Move switch ① on the turn signal lever to position , or press the button on the multifunction steering wheel. The system is switched on. No speed has yet been stored and the speed is not yet being controlled. Switching between the CCS and the speed limiter. Press button ② on the turn signal lever, or press the button on the multifunction steering wheel. This switches between the CCS and the speed limiter . Activating the CCS. Press button ③ on the turn signal lever at the area marked , or press the button on the multifunction steering wheel. The current speed is stored and controlled. Switching off the CCS control temporarily. Press switch ① on the turn signal lever into position , or press the button on the multifunction steering wheel. OR: briefly press the button on the multifunction steering wheel. OR: depress the brake pedal. Control is switched off temporarily. The speed is stored in the memory. Resuming CCS control. Press button ③ on the turn signal lever at the area marked , or press the button on the multifunction steering wheel. The stored speed is reactivated and controlled. Increasing the set speed (during CCS control). Press button ③ in the area marked , or briefly press the button on the multifunction steering wheel to increase the speed in small increments of 1 km/h (1 mph) and to store the speed. The vehicle accelerates actively until it reaches the new set speed. Press button ③ on the turn signal lever in the area marked , or press and hold the button on the multifunction steering wheel to increase the speed continuously until the button is released and to store the speed. Decreasing the set speed (during CCS control). Press button ③ on the turn signal lever in the area marked , or briefly press the button on the multifunction steering wheel to reduce the speed in small increments of 1 km/h (1 mph) and to store the speed. The system will decrease the speed until the new set speed is reached by easing off the accelerator without actively braking. Press button ③ on the turn signal lever in the area marked , or press and hold the button on the multifunction steering wheel to reduce the speed continuously until the button is released and to store the speed. Switch off the CCS. Move switch ① to the position. 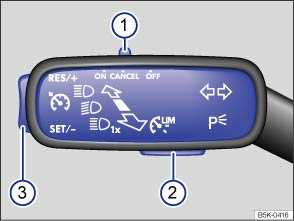 OR: in any operating mode, press and hold the button on the multifunction steering wheel. The system is switched off. The stored speed will be deleted. The CCS reduces acceleration as soon as the clutch is depressed, and automatically continues to regulate the speed after a gear change. If the CCS cannot maintain the vehicle speed when driving downhill, brake the vehicle with the foot brake and shift down gear if necessary. If the system detects a fault that could impair the function of the CCS. If the vehicle speed is higher than the stored speed for an extended period with the accelerator pedal depressed. If regulation related to the driving dynamics is taking place, e.g. by TCS and ESC.